Please contact us, we will be happy to assist you. Monday – Friday: from 10 a.m. to 3 p.m.
office hours: wednesday 10 a.m. to 16 p.m. The LAKS office is located on the “Alter Schlachthof” site in Karlsruhe. From Karlsruhe Central train station (Karlsruhe Hauptbahnhof), use the tramway lines 2, S4 or S41 and stop at the station Tullastraße. From Karlsruhe city centre, use the tramway lines 1 or S5 and stop at the station Tullastraße. Once you've reached the East side of Karlsruhe, follow the signs indicating “Kultur- und kreativpark Alter Schlachthof”. A car park is direct next to our office. 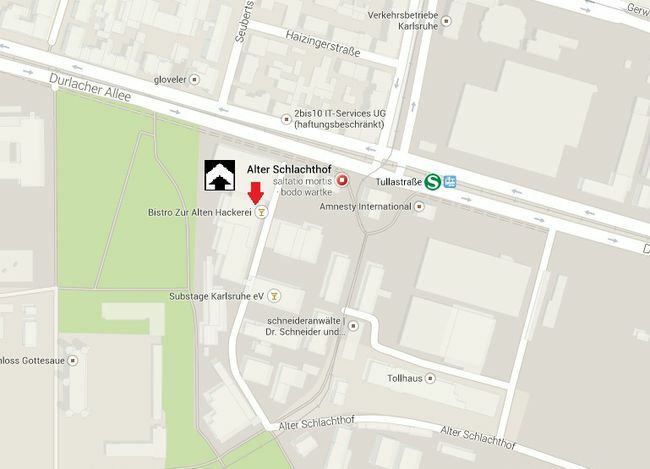 Our office is located on the west part of the area, next to the bar “Alte Hackerei”.